Oops - we don't appear to have a video for the DocuMate 3920. 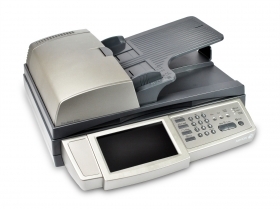 Direct connect scanners are a vital part of your document capture strategy, but network scanners, like the DocuMate 3920, are the perfect solution for an office that has shared scanner needs. Network accessible scanning achieves two major goals for your document workflow and capture with great efficiency and ease of use. First, a network scanner can be conveniently located in common areas and does not require a PC connection. Second, the scanner can easily access broad network connections to file servers, email servers, FTP locations and printers and fax servers. The DocuMate 3920 is designed with convenience and ease to support small to medium workgroups and offices through a standard Ethernet connection and provides a secure multi-user access, with easy administration, through an embedded form-based web page configuration. No expensive IT department or network contractor is needed to begin scanning documents to local servers or FTP locations. Email can now be delivered anywhere on the internet (or simple fax sending and receiving) through standard phone line. The scan-to-email feature lets users scan paper-based documents in full color and e-mail them in PDF, JPEG, or TIFF file formats directly from the scanner. The Xerox® DocuMate 3920 supports LDAP (lightweight directory access protocol) for direct access to Microsoft Exchange Server email directories and up 2,000 custom e-mail addresses can be added to the device.